A classic pesto sauce that is dairy free! This pesto sauce is so versatile and is made with fresh basil, pine nuts, garlic, lemon juice and olive oil! Serve it over rice, pasta, roasted vegetables, Italian bread and chicken! This pesto sauce guys…THIS recipe! Oh man…where do I start?! I love all kinds of sauces…marinara, alfredo, butter garlic and vodka marinara but I think pesto sauce is my all time favorite. Why? Well, because it’s so versatile! Do you know all the things you can do with pesto sauce? Let’s dive into all the yummy ways you can use pesto sauce. But before you do, I often get asked if Pesto Sauce is dairy free. The answer is most of them are not, which is why I’m so excited to share with you my dairy free pesto sauce recipe! 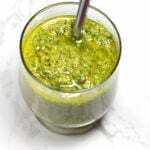 I use this dairy free pesto sauce recipe in my all time favorite recipe, Pesto Chicken Thighs. It’s so delish! I had it again for dinner tonight! It’s one of the kids most favorite recipes! And, it’s a healthy fat! Italian bread – smear it on bruschetta or you can also bake this pesto sauce into bread! There are just so many ways to use pesto! And it’s so simple to make! Especially this gluten free AND dairy free version! Yep! A dairy free pesto sauce! Let’s dive in! Now don’t get me wrong…sometimes I have crazy busy days or I just get lazy and I want to buy a jar of pesto sauce. (My favorite brand is Kirkland’s Pesto Sauce. You can buy this at Costco) And there is nothing wrong with buying a jar of pesto sauce! 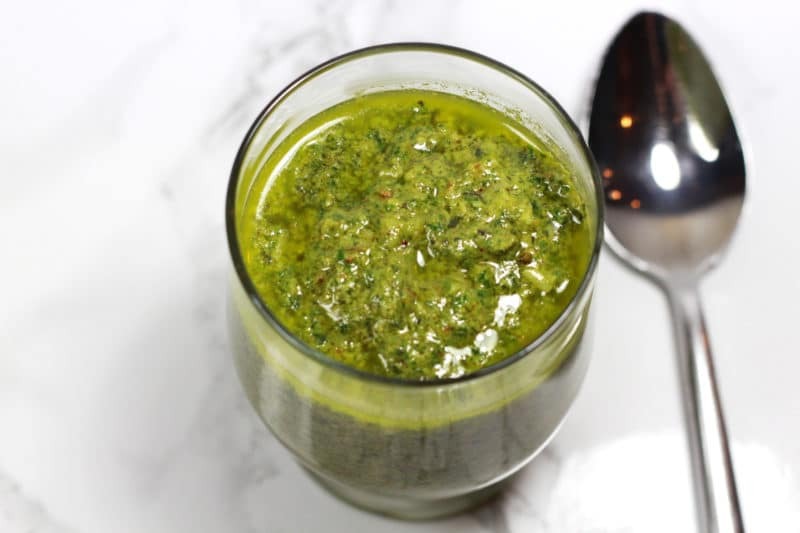 BUT – it’s hard to find a dairy free pesto sauce brand and sometimes I just want to make my own pesto sauce and get creative on what I pair it with. And then there are times where I want to mix up my pesto sauce a bit like I did in my Three-Vegetable Penne with Tarragon-Basil Pesto and my Mushroom and Chicken Penne with Walnut Pesto. Regardless of how you switch it up, pesto sauce is hard to mess up! 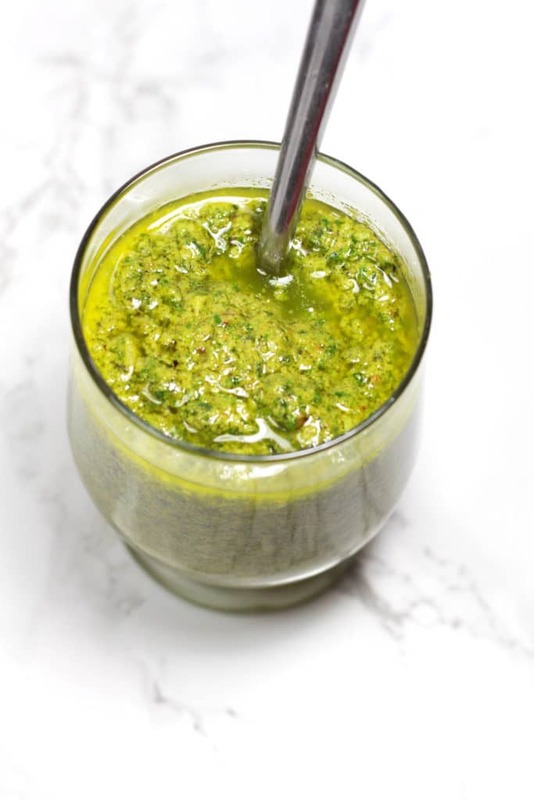 And if you’re not dairy free, go ahead and add in the Parmesan cheese…but with this dairy free pesto sauce recipe below, you don’t need it! The taste is amazing! 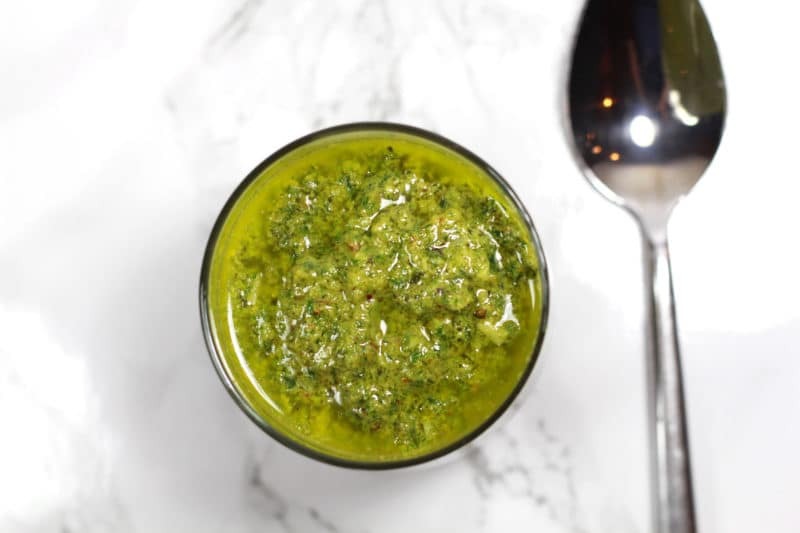 Go dairy free with this pesto! Pour 1/4 teaspoon extra virgin olive oil in a skillet. Lightly toast the pine nuts in a skillet over medium heat for 5 minutes. Place all ingredients except for the extra virgin olive oil in a small food processor or blender. Slowly incorporate the extra virgin olive oil while the machine is running, until a smooth paste has formed. Continue blending for 15 seconds to thin the sauce out. NOTE: I sometimes add more olive oil if needed. Take the pesto sauce from the machine and warm it in a saucepan on medium until warm. You’re going to love this version of pesto sauce! I can’t wait to hear what you pair your pesto sauce with!! Leave me a comment and let me know! Who know…you may inspire me to make a new recipe! Don’t forget to pin this DAIRY FREE Pesto Sauce to your favorite SAUCE and PASTA board on PINTEREST!! I’ve never made homemade pesto. I’ll have to give this a try! It’s worth making! You’ll love it made from scratch.